Maricopa County Sheriff Paul Penzone addressed a group of about 900 Sun City West residents on Feb. 7 to discuss his reasons for temporarily shutting down all volunteer posse organizations—including the one in Sun City West. Mr. Penzone began the meeting by explaining that an audit determined problems with a few members among the 30 volunteer posses in the MCSO command structure. Many applications, when checked, were incomplete or not updated, he said. Checks showed that some individuals had committed crimes or engaged in other activity which made them unsuitable for service wearing the badge and uniform of the MCSO. These problem situations were not in the Sun City West Posse, but the sheriff said he had to shut things down countywide and do a complete check. PORA President Larry Woods with 4,100 signatures to reinstate the Sun City West Posse. 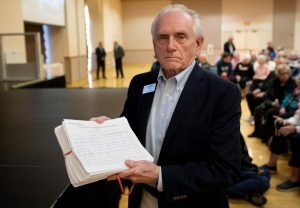 Larry Woods, Property Owners and Residents Association president, presented the Mr. Penzone with petitions signed by more than 4,100 persons asking for the posse to be reinstated. The sheriff has promised to have all background checks and other requirements updated and completed by March 25. John Bailey, executive chief deputy for enforcement, said Sun City West Posse commander Myron Finegold was being very helpful in providing all information on posse members to help the process move smoothly. Mr. Bailey said the MCSO is paying for all background checks and will provide extra assistance in the community, even on weekends, to help speed up the process. Once posse members have completed everything and are cleared they may return to patrol duties immediately. The sheriff shut down all Posse duties on Jan. 25. The Sun City West Posse offices have remained open during the shutdown as associate members take care of administrative duties, refer calls for service to the MCSO, and take information for future vacation watches.